When you start itching to make and bake something, it doesn’t have to be something sweet. 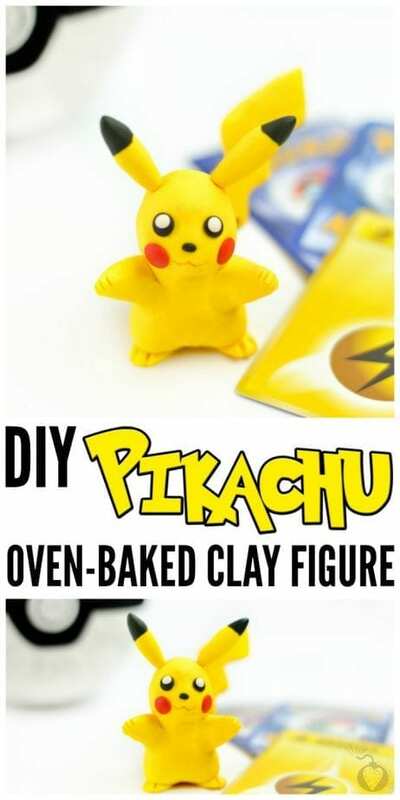 You can make and bake a DIY Pikachu Clay Figure that is totally cute and bit feisty. We had so much fun making this adordable little guy and we are sure you will too! Pika Pika means let’s get started! Note: As you start to work with the clay, it will become easier to mold. To start, you will take a piece of yellow and create a oval shape for the body. Use your fingers to mold it and cover and impurities. Take another piece of yellow and make a round spherical shape (this will be the head). 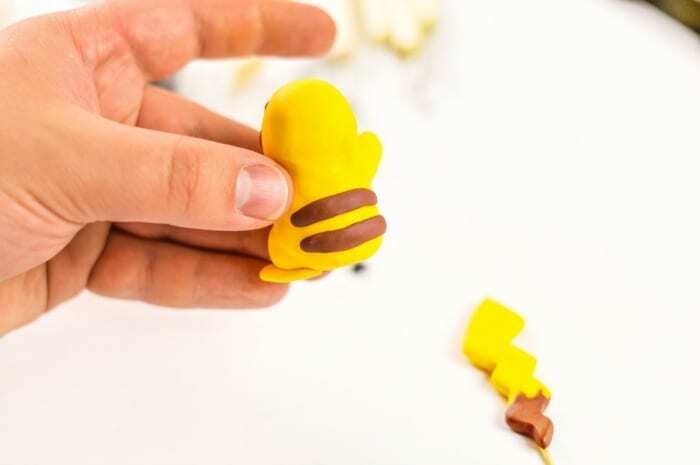 Now take the two pieces together and start to carefully mold them together using your fingers. You essentially want the two pieces to become one. Now you can take 2 small pieces of yellow and add them to the middle of the stomach area. These will become Pikachu’s arms. Tip: You can basically pinch the clay together and then smooth it out with your fingers. Take another 2 small pieces and roll them in your hand. 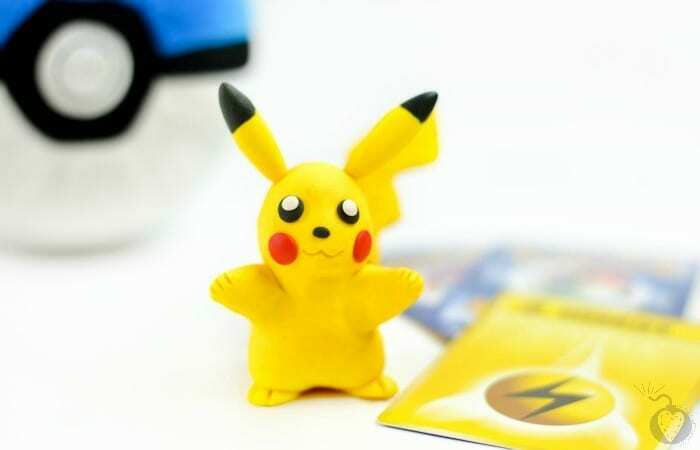 You will want to flatten them a bit because they will become Pikachu’s feet. The rest is all about building the details. 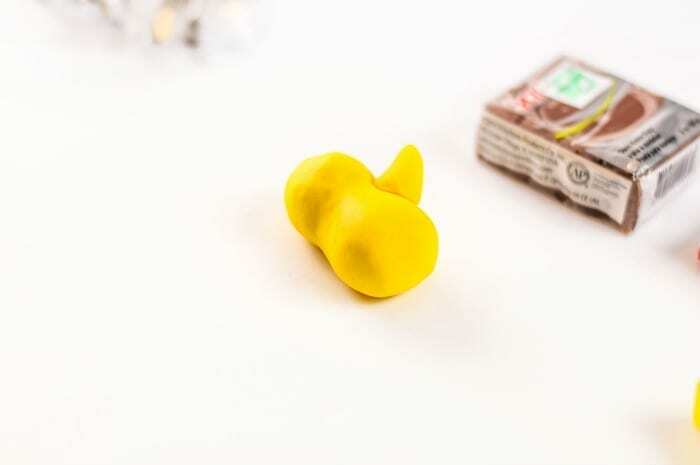 We first started by making the ears by using yellow clay rolled up and then brought to a point at the top. We then added a small piece of black to the tip. We then broke a toothpick in half and stuck one piece into the bottom of the ears to give it some stability. 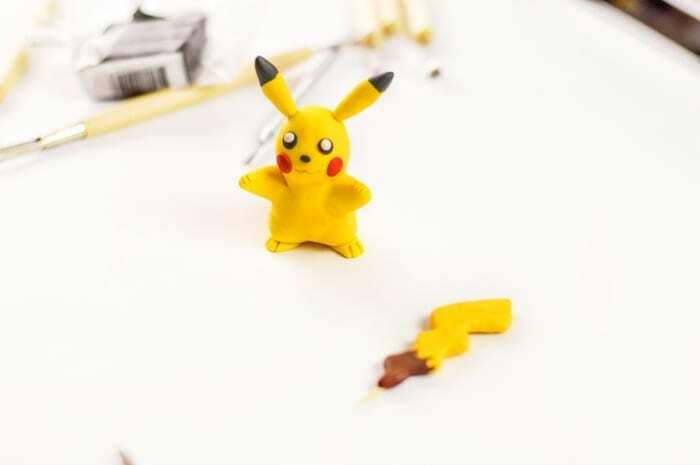 We also added a few brown stripes to the back of Pikachu to make him look more authentic. We did the same with the tail only we used yellow and brown to mold the tail. We then added a full-size toothpick to the back side of the tail to support it. Once your ears and tail are done, you can add eyes and the red dots on Pikachu’s Face. 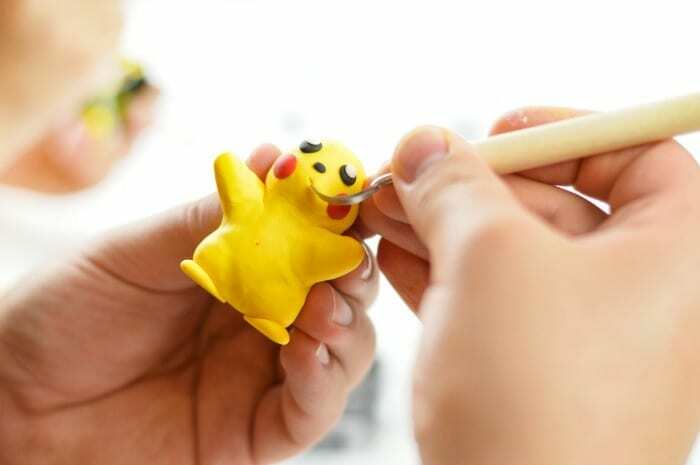 The next step is to take the hook tool from your tool package and add a few fine details like a smile and indents in Pikachu’s hands and feet. 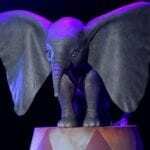 Now attach the tail and ears carefully and enjoy your new little guy! Truly the easiest way to know how to make this adorbale little creature is to watch the live video we filmed while making this. 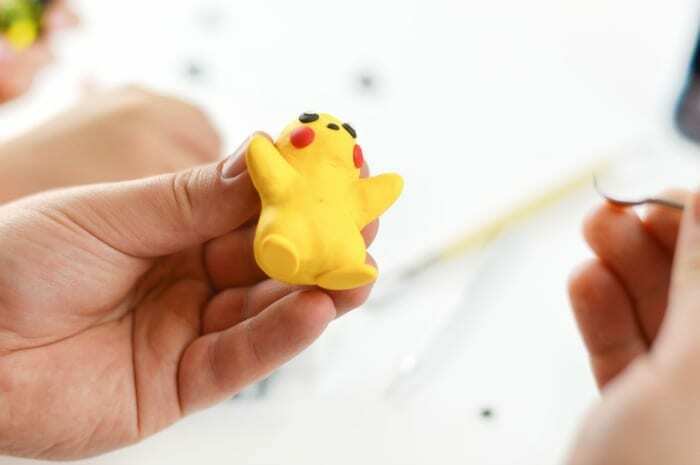 We’ve included it for you below and you can see how we made Pikachu with clay from start to finish! If you do decide you want your clay figure to be hard and un-moldable once finished, you can follow the instructions on the backside of the oven-bake clay to bake the clay in the oven. It will then harden the clay and it will be a great figure for display. This step is optional and not necessary. However, this type of clay will not dry out unless it is baked. Looking for more Pokemon Fun? Did you know your Pokemon Trading Cards Are Once Again Worth Money? 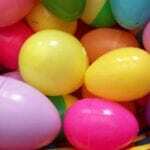 Check that out here!